I have been struggling with combing my two favorite ways of making art- watercolor and oil painting-for three years now. There are many reasons I have wanted to do this but at he top of he list is that we’ve all gotten so used to seeing color through a back lit screen that there’s an expectation of brightness in order for color to visually satisfy. It’s hard to get that kind of intensity in oil paint. The Golden Paint Company has a new line of watercolors called QOR that are as bright as you get and I’ve enjoyed the results I’ve gotten with them. So far there isn’t any work that I’m aware of that combines these two mediums in an archival way. I like that kind of challenge. Working in a way that’s technically difficult gets me to really concentrate which just plane make the work better. My long term technical advisor Martha Bergman, formally of Gamblin Paints, has been hugely helpful with advice and general cheering on. One of Martha’s suggestions that been HUGE is to paint on Terraskin, a paper made of Gesso. My long term framer, Eric Gardner, has helped me work out the technical glitches of glueing the Terraskin onto panels for a great painting surface that handles both mediums beautifully. My long term use of chemically melting cold wax into Galkyd Lite has helped seal the surface, protecting the watercolor from the elements. Finally, finally, the paintings started to work in a way I hope they would. This is especially sweet after much disappointment and cast aside work. My Portland dealer Charle Froelick even had to tell me last fall, hat he wasn’t relating to what had been coming out of my studio. 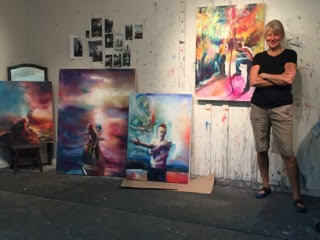 Charles and Froelick Gallery director Rebbecca Rockom have now made two studio visits to see my latest progress. They’ve recently chosen these four of the newest watercolor/oil work to be shown in a colorful summer group exhibit along with headliner Japanese artist Risuko Ozeki. I will have my own exhibit of the watercolor/oil work in October, 2018.